Dogs eat raw meats in the wild so domestic dogs can also eat raw meat without any adverse side effects. This is an increasingly common belief among dog owners, a trend that doesn’t seem to let up even when there are known risks involved. Before you feed your dog raw meat, whether it’s a cut of pork or a slice of steak, here are a few things that you have to consider. Nonetheless, keep in mind that the decision to feed raw meat to domestic dogs is a personal decision that the owners have the right to make. You may or may not feed raw meat in any size, shape and form to your dog and you should be respected for your decision. You should ideally, in turn, respect the decision of other pet owners to feed or not to feed raw meat to their dogs. But remember that just because dogs can digest raw meat – their digestive systems are naturally designed for it – doesn’t mean that they should be eating it either! 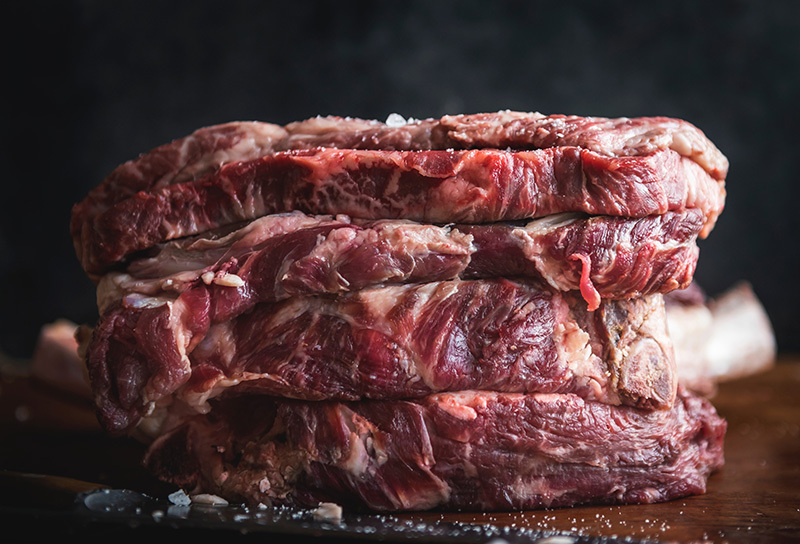 All types of raw meat, from poultry to pork, beef and wild game, contain bacteria like listeria and salmonella that can harm both animals and humans. In fact, many government regulatory agencies including the Centers for Disease Control and Prevention (CDC) and the Food and Drug Administration (FDA) strongly recommend against feeding dogs any kind of raw meat, and it’s a recommendation that responsible pet owners are well-advised to heed for the following reasons. On another note, certain fruits and vegetables like bananas and carrots in their raw form can be given to dogs. These add more variety and nutrients to their diet but don’t overdo it – dog experts at PetCo recommend that raw fruits and vegetables should only comprise 10% of your dog’s daily diet. Dogs in the wild feeding on fresh meat seems like such a fascinating thing to watch on National Geographic but there are plenty of reasons why domestic dogs – your beloved dog in particular – shouldn’t dine on it. Raw meat, quite simply, isn’t good enough for dogs. Even when eaten in large quantities, it doesn’t provide the balanced and complete nutrition that your pet needs to lead a healthy and active life. Furthermore, a raw meat-only diet for domestic dogs doesn’t even mirror the diet of wild dogs that often eat whole animals and plants. Dogs also have complicated nutritional needs, not to mention that dogs of different ages, condition, and breeds have different nutritional needs, too. Feeding raw meat, either as part of a dog food-based diet or an exclusively raw meat diet, can result in illnesses due to nutritional deficiencies. Most dog owners neither have the resources nor the expertise to create a balanced and complete raw food-based diet, too. The bottom line: Feed your dogs the right vet-approved dog food at the right time in the right quantity. You will not only be keeping them healthy, thanks to proper nutrition, but you’re also keeping them happy. You know what they say about a happy pet – a happy pet owner, of course. Dogs are at higher risk for food poisoning caused by bacteria when they eat raw meat. The most dangerous bacteria are salmonella and listeria monocytogenes, which can be found in raw or improperly cooked meat, organs, and bones. A salmonella infection can cause a wide range of symptoms including bloody diarrhea, vomiting, fever, loss of appetite, and decreased activity level. A listeria infection can cause diarrhea, fever, and nausea, as well as a type of neurological disease in a small percentage of affected animals. You definitely don’t want your dog to be infected by these bacteria! While these infections can be treated by antibiotics, these are best prevented by not feeding raw meat to your dog. Even when your dog doesn’t become sick from exposure to the salmonella and listeria bacteria, you and your family can become sick. Your dog becomes a carrier for these bacteria and transfer them to their surroundings and on surfaces (e.g., carpets and tables), as well as transfer it when you’re holding him or when he’s licking your face. Your dog can also spread the bacteria during his bowel movement. Like your dog, you or your family members may experience the symptoms of a salmonella infection including fever, nausea, vomiting, bloody diarrhea, and stomach pain. If you get a listeria infection – it’s rare but it can have a fatal effect – you will likely take antibiotics to prevent its spread to your brain and spinal cord. With all these negative effects, you should think twice about feeding your dog any type of raw meat, even when it seems cute. If you must feed him raw food, you should stick to the fruits and vegetables.